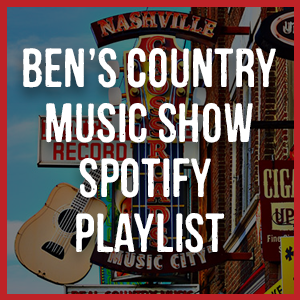 Ben’s Country Music Show is a two-hour weekly radio show featuring the best in country music, roots Americana and bluegrass which is broadcast on stations across the UK each week. The show began in May 2008 and in 2018 will celebrate its 10th anniversary. Each week Ben Atkinson-Foster presents the show from his studio in the beautiful cathedral city of Lincoln in the East Midlands. Each week the show features the latest music from the USA and UK, mixed in with country classics and live sessions. Ben brings you the latest news from Nashville, This Week in Country Music and both the Billboard country album and airplay charts. Ben’s Country Music Show began life on 103 The Eye, a community radio station serving Melton Mowbray and the Vale of Belvoir and the first in the UK to be awarded a five-year licence by the government. To that end, it is the oldest community radio station in the UK. For the first couple of years, Ben presented the show live each week, sometimes with a guest presenter and often with a full country band squeezed into the tiny studio…. it was always great fun! After moving to Lincoln to study Media Production at the city’s University, Ben set up his own studio at home and the show expanded to be broadcast on a series of other community stations across the Midlands, many of which it is still featured on to this day. Interviews and live sessions have always played an important part in Ben’s Country Music Show and Ben has been lucky enough to interview a broad cross-section of artists from the USA and the UK, including the late Lynn Anderson, Charlie McCoy, Gretchen Peters, Bob Cheevers, The Shires, Ward Thomas, John Montague, Gary Quinn and Charlie Landsborough. Many of these artists have become firm friends of the show and returned to co-present or play live on numerous occasions. You can hear a selection of these interviews at any time, right here on the site. Over the year’s Ben’s Country Music Show has been broadcast on a range of unique and exciting stations, including a stint on the UK’s country music station, Chris Country. Currently, the show airs on 103 The Eye, where it all began, County Linx Radio and Rasen Radio in Lincolnshire, Hermitage FM in North West Leicestershire and Wey Valley Radio in Hampshire. In addition, the show is also broadcast on Sunshine Radio UK, an online country music station. You can find out more about all of these stations and when the show is broadcast on the on-air page of this website. As we look forward celebrating the show’s 10th anniversary in 2018 it’s a great opportunity to look back on all that has taken place in the last decade. When the show began in 2008 the UK country music scene was a very different place – there was no C2C Festival, no major UK country acts like The Shires or Ward Thomas and country was very rarely featured on mainstream radio outside the BBC. In the year’s that followed Ben’s Country Music show has grown to become one of the most prominent specialist music shows on independent radio in the UK with a growing number of listeners both in the UK and internationally. Ben Atkinson-Foster has been presenting on UK radio for over ten years. His presenting career began on 103 The Eye in Melton Mowbray, the first community radio station to be awarded a five-year licence by the UK government. Ben learnt his craft at the University of Lincoln, graduating with a first class BA(Hons) in Media Production and an MA in Digital Media and has been awarded by the institution for his Outstanding Contribution to the Lincoln School of Film and Media. His training and experience within the creative industries is widespread and includes being an alumnus of the prestigious BBC Production Talent Pool, a six-month sabbatical studying and teaching at the Minnesota State University Moorhead in the USA, founding and managing a student radio station, Brayford Radio, and several years at the helm of his own design company, Tall Lime. Ben’s interest in country music began as a child, discovering the music collection of his parents and grandparents. Over the years he has written extensively about the genre, focusing his research on the changing British attitude to country between the 1960’s and the present day. He has been a member of the Country Music Association of America (CMA) since 2014.